First heard echoing through the bullfighting rings of Spain in the late 1700s and popularized in soccer culture in the 1980s, the word “olé” is a universal expression of triumph and jubilation - which is exactly how Ryan Mack and Dallas Siemens see their jeans. “‘Olé’ is the expression of joy, the celebration of life. It’s what we feel and how we want other people to feel when they put on our jeans,” said Siemens, co-founder of Olé Denim. 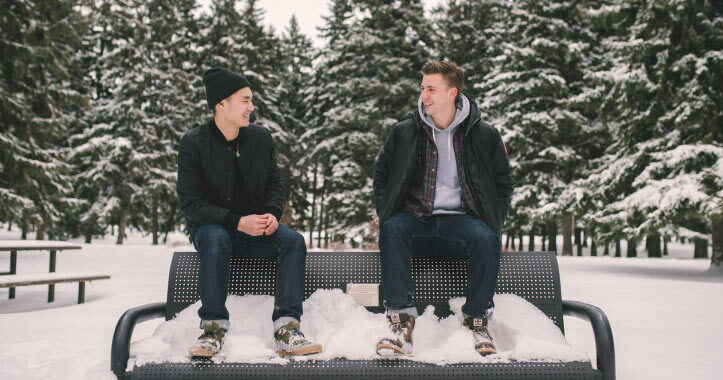 Alongside Winnipeg-based graphic designer Chris Watchorn, Siemens and Mack are the men behind Saskatoon’s newest denim brand, Olé. Founded in 2013, Olé began as a pet project between friends and has since grown to become the only company of it’s kind in Saskatchewan. Though born and designed on the Canadian prairies, Olé Denim’s unique products are sourced and manufactured internationally. Their jeans start their journey at the Kuroki denim factory in Okayama, Japan, where the finest denim is chosen before being flown to Los Angeles where they are ethically manufactured and made ready to wear. Despite being a small part of the already niche raw denim market, Olé sets itself apart from its competitors through the sheer dedication and attention to detail that Mack, Siemens and Watchorn put into every pair of jeans they produce. From the intricate process through which the denim is woven and dyed to the finishing touches such as the hand-made and stamped leather patches created by leather artisan Ken Diamond in Vancouver, Olé jeans are truly a work of art. “We’re not some big company trying to mass-produce. We’re going for a heritage feel,” said Mack. The Japanese raw denim that goes into every Olé product made in Okayama is rope-dyed, which involves gathering and twisting the fabric into ropes and then dipping it into indigo ink. This process prevents the ink from being fully absorbed into the fabric, allowing for that fashionably “faded” look to be achieved much more easily. The fabric itself is woven on a vintage shuttle loom, which results in the white selvage ends along the seams of the jeans that prevent them from unraveling or fraying. Vintage looms were used up until the 1950s when many manufacturers switched to projectile looms which are capable of producing denim more quickly using less fabric. The jeans also go through the process of sanforization, which refers to the treatment and stretching of fabrics before they are cut in order to stop them from shrinking after being washed. Olé Denim’s first line, affectionately dubbed the 306, will be released this spring and will offer customers a choice between the more common 13-ounce jean or the heavier and more winter-friendly 15-ounce jean. Female fans of raw denim will have to wait to try on their first pair of Olé jeans, as the 306 line will be limited to men’s fashions. Though Mack, Siemens and Watchorn have found the perfect fit for their first line, it wasn’t always an easy road getting here. “Have you ever seen the show How To Make It In America? There’s one episode where they get their first pair of [sample jeans] and they fit completely weird and high-waisted. The same thing happened to us. They were really baggy and just terrible,” added Siemens. Undeterred by this initial disappointment, the trio pressed on and after two years of development it seems they have finally created what they initially set out to — a pair of jeans that are as functional and comfortable as they are fashionable. Olé Denim strives to provide the wearer with a high-quality blank canvas that they can customize according to their taste and lifestyle. The 15-ounce jean in particular allows for a high degree of specialization because it is made up of what is referred to as “slubby” denim, or denim in which inconsistencies in the fabric are present due to the fact that it is produced on a vintage shuttle loom. “Slubby” denim was initially viewed as being riddled with flaws due to the unevenness of the yarn, but Japanese designers have since come to embrace these subtle imperfections and intentionally add them to their jeans to give them more character. “The Japanese see these different imperfections as being beautiful,” said Mack. This innovative way of looking at denim production is the reason why Olé chose Japan as the source for their fabrics. The three-person company hopes to redefine the way that people in both Canada and the world think of fashion in the prairies. The Olé brand’s prairie origins are evident in the rugged simplicity of their products. Their jeans wouldn’t be out of place in a business setting or a backwoods cookout and their timeless blue hues match everything from casual t-shirts to formal button-downs.